When it comes to finding your forever home, there are certain things that you need to check off the list. One of the most common things that we hear people look for when seeking out a house that they can turn into a home is storage space. While having ample storage throughout the home is nice, the amount of storage space that you have available in your kitchen is crucial. 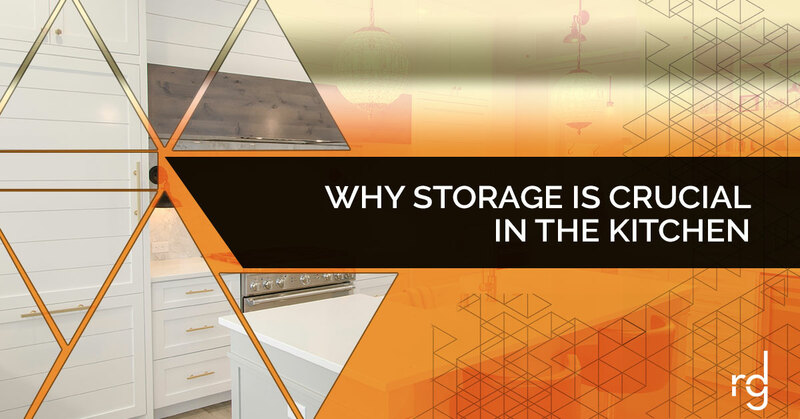 Whether you’re in the process of redesigning your kitchen, considering placing your home on the market, or you’re looking at purchasing a new home, it’s important to understand why storage in the kitchen is so incredibly beneficial. The team at Rinehart Design Group has compiled a list of all the reasons that investing in quality cabinetry will be one of the best decisions you’ve made to date. Preparing a meal when you have limited cooking space is a challenge that most of us hate to be faced with. Whether it’s shuffling things around to make sure that you have enough space for the task at hand, or you’re going from one side of the kitchen to the other to use an appliance, the more cluttered the kitchen, the more complicated the recipe. With plenty of storage available, you’re able to free up some counter space so that you can whip up and serve delicious meals easily. Whether you choose to keep appliances put away until it’s time to use them or you have more availability to organize your kitchen, being able to keep your counters clean is a huge bonus when preparing a meal! We just talked a little bit about clutter and how keeping your kitchen free of clutter can make all the difference when you’re cooking. Aside from that, keeping your kitchen free of clutter can make the space look so much cleaner! While there are certain things that you can keep on your counters, utilizing the available storage space in your kitchen will contribute to an overall cleaner look and minimize the chances of a mess building up. If you’re tired of feeling like you need to tidy up this space at the end of every day, you need to get a taste of what ample storage looks like. It’s amazing how great a space can look when every item in your kitchen has a space to call home. At that point, there’s very little that needs to happen for the space to look tidy. When we’re talking about a smaller kitchen space, storage becomes even more critical. In smaller kitchens, it’s incredibly easy for clutter to pile up and make the kitchen look messy. Aside from that, it’s already a little bit difficult to prepare a great meal without feeling confined to space. For those reasons and many others, it’s essential that you take advantage of storage opportunities! By utilizing the storage space available in your kitchen, you can make the space look and feel so much larger! You’ll be thankful that you have this storage space when you’re able to quickly prepare a meal with ease and tidy the space up in minutes. Investing in custom cabinets for your kitchen is something that you’ll benefit from immediately, but it’s also going to add value to your home. Of course, you’ll be able to get your money’s worth out of these custom cabinets the moment that you store all of your belongings in them. However, it’s nice to know that if you ever do sell your house, or if you’re looking for ways to boost the value currently, that you’ll get that from this investment. The kitchen is the room that is most likely to catch someones attention when they take a tour or schedule a showing. That being said, you can know with confidence that any investment you make in this space is going to be well worth the money that you spend and will benefit you in the long-run. If you’re lacking the storage that you need in your kitchen, reach out to Rinehart Design Group. Our team has been fortunate enough to provide various homeowners across the United States with the storage space that they’re in need of. Not entirely sure what you need in regards to storage? Allow our team to dream it for you! We have a passion for design! We strive to be efficient and creative with each of the designs that we create for our customers. Contact our team today and let’s get started on the new pieces of your kitchen.